Another "beautiful" day in the Sierra foothills! One of the things I enjoy about serving on the board of the California Wool Growers Association (I'm currently the vice president) is the chance to catch up with fellow sheep producers from all over California at our board meetings. And as with most conversations among ranchers, the talk inevitably turns to weather and forage conditions. Weather and grass (and their effects on the market) it seems, are the variables that unite sheep ranchers large and small. After yesterday's board meeting in Woodland, I've realized that we're extremely fortunate to have green grass in our pastures near Auburn this December; I'm also concerned that the current stretch of dry weather might be the front end of another drought. 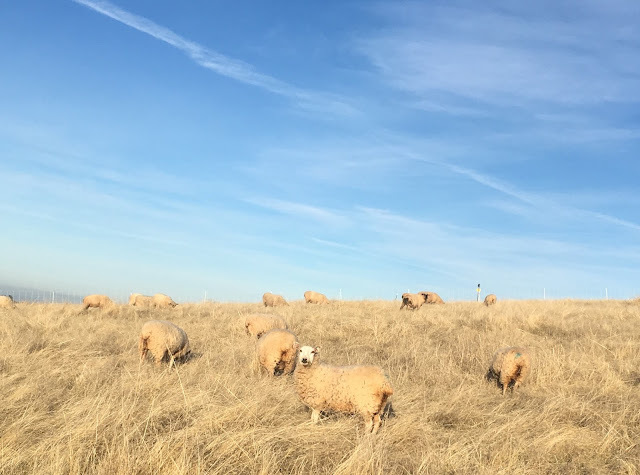 Board members who raise sheep in the San Joaquin Valley and Central Coast reported yesterday that the grass hasn't started where they are - they simply haven't had enough (or in some cases, any) rain. These reports match my own observations from a trip south through the Sierra foothills in mid-November - the green grass seemed to peter out before Jackson. Several of my cattlemen friends have confirmed that our part of the northern foothills are unique this year - we're the only ones with green forage at the moment. At the moment, we have enough green grass ahead of our sheep to make it through the next month or two. With the shorter days and colder temperatures that coincide with the approaching winter solstice, our green grass has now gone dormant - even with rain, it won't start growing again until February. Without rain between now and February, however, the resumption of growth will be delayed. Our entire production system centers on matching lambing with the onset of spring growth in late February. Since ewes are pregnant for approximately 5 months, we've already cast the die - we are depending on winter rain to bring late winter and early spring forage for our sheep during their period of greatest demand. The lack of rain in the forecast, and the dry conditions most everywhere else in California, have me worried. 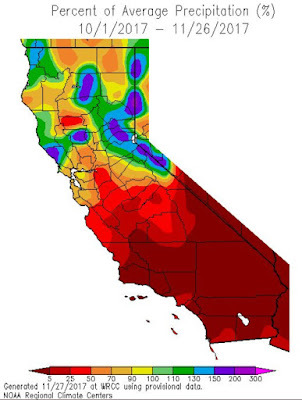 California is much drier than normal for this time of year. Because of the 2012-2015 drought, we've made adjustments in our management to be able to cope with dry conditions. We stock our pastures conservatively, which allows us to stockpile forage. While this leftover dry grass is filling, it lacks the nutritional power required for lactating ewes - and so we've also purchased supplemental protein as a hedge against continued dry conditions. Since our flock's forage consumption increases by nearly 50 percent during lambing, we may need to move the sheep more frequently than in a typical year. We'll start planning on spending more time building fence and moving sheep if conditions remain dry. In the meantime, I'll be thankful for the rain we've had (over 8 inches since October 1). I'll be grateful for the green grass we see in our rangeland pastures (mostly hiding under last year's growth). I'll try to enjoy these "beautiful" winter days (although beautiful December weather for a California sheepman includes rain). And I'll say a little prayer for my colleagues who are battling drought in other parts of the state.